All rooms are equipped with bath or shower / WC, telephone, radio, cable TV and mostly with balcony. Absolutely quiet location with views of the Gastein mountains. Passenger lift available. 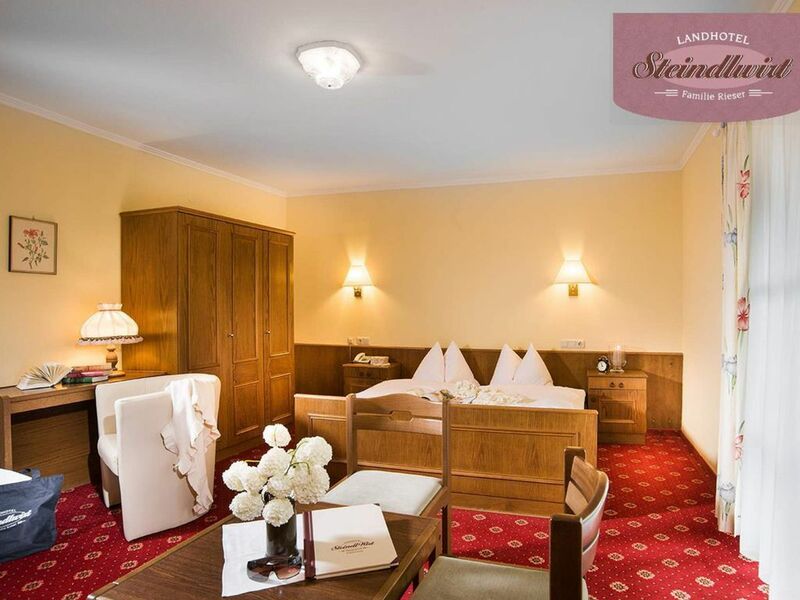 3 Stars Landhotel Steindlwirt: The right address for your relaxing holiday in Dorfgastein!Location of the accommodationExperience an unforgettable holiday in one of the most beautiful regions of Salzburg, in the midst of the mountains of the Gastein Valley. In the center of Dorfgastein and quiet, our house offers an ideal starting point for your hikes and the visit of the Alpentherme. Whether hiking-enthusiastic and ski-enthusiastic families with children or recreation-seeking spa guests - in the Steindlwirt are all welcome. Description Enjoy your holidays in the cozy setting of our traditional house with its 26 rooms or in one of the two cozy apartments. Our rooms, which are easily accessible by lift, are available in single, double, triple and family rooms. The bathrooms are equipped with shower and toilet, hair dryer and towels. In our hotel we can accommodate groups up to 45 people. A parking space next to the hotel is at your disposal as well as a lockable parking space for your bike. Our two apartments are located just below the Dorfgastein gondola station and are located next to the children's practice meadow. The apartment Bernkogel is designed for up to 7 people. It consists of a bedroom, a children's room, a kitchen and a large living room with a sofa bed, a bathroom and an extra toilet. The smaller apartment Stubnerkogel impresses with its unique view to the south. There are six people here. Both apartments have spacious balconies for enjoying the sunset. In our kitchen it says: "Here cooks the boss! "He emphasizes the use of seasonal, regional and organic foods. Be enchanted by our delicacies and enjoy our wellness oasis with infrared cabin, steam bath and Finnish sauna. Winter in GasteinWhen skiing in the Ski Amadé, hiking on winter hiking trails, cross-country skiing in Sportgastein or in Angertal- in the Gastein Valley, everyone will find the opportunity to make their holiday unforgettable. Summer in Gastein Around Dorfgastein you can expect beautiful sights, interesting activity programs and exciting attractions. Experience the mountains of Salzburg and feel the power of Gastein thermal water!Family Rieser is looking forward to your visit!